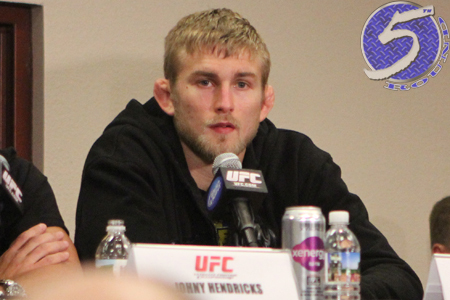 On Saturday morning, it was announced Alexander Gustafsson (Pictured) will be rolling out the welcome wagon for former Strikeforce light heavyweight champion Gegard Mousasi. The event takes place April 6th inside Ericsson Globe Arena in Stockholm, Sweden. The same venue hosted the Octagon’s Swedish debut this past April. The 205-pound affair headlines the festivities. Gustafsson will be riding a six-fight winning streak into the shootout. “The Mauler” was seen in December living up to his nickname by steamrolling former champ Mauricio “Shogun” Rua. The 26-year-old’s lone professional blemish came in his second UFC fight when he was submitted by Phil Davis. Mousasi concluded his Strikeforce career in emphatic fashion by tapping out, and likely retiring, Mike Kyle last weekend. “The Dreamcatcher” has posted an impressive 20-1-1 mark since 2006. The only loss during his current run cost him the Strikeforce crown to Muhammed “King Mo” Lawal in a 2010. FUEL TV is expected to broadcast the main card live in America.